I’ve heard people say they their kids won’t eat whole wheat pancakes, but my kids just gobble them up and ask for more! Maybe they love them because that’s all they have ever known. We put fresh peaches on top. But you can use whatever fruits you have on hand. 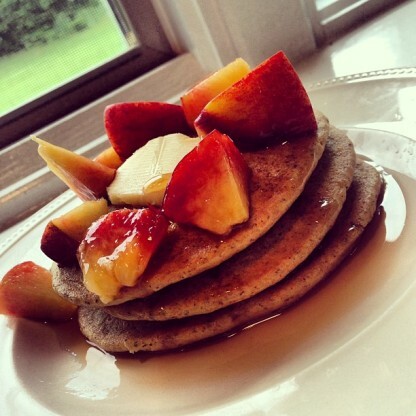 You’ll find these whole wheat pancakes are great with bananas, raspberries, blueberries–whatever you like. Now, these pancakes, whole wheat, do look a little different. They were a little more dense than a regular, white flour pancake, but they were still fluffy, and tasted fabulous! TIP: You may need to add more milk to your mixture. It just depends on how thick it is. You need to be able to pour it easily from a blender. Another option: Make it in a bowl and puree the nuts and seeds separately in a food processor if you need to. ⅓ cup flaxseed meal. Put this in a Vitamix or blender. Even if the sunflower seeds don’t mix in completely, it will give it a nutty texture that is really good. Mix all the dry ingredients: flour, baking powder, baking soda, and salt in a bowl. Process the flaxseed meal and sunflower seeds in a Vitamix or blender. Mix the milk and oil/butter in a separate bowl. Combine all ingredients until you have a thick batter. Add more milk if necessary. Cook on a greased non-stick or cast iron pan or griddle.